Twitter Inc. (NYSE:TWTR) is having a triumphant 2018 as the company reported its second profitable quarter on Wednesday. The company trounced the Wall Street’s expectations as its revenue clocked $665 million in Q1 2018, an increase of 21% YoY. The overall monthly active users (MAUs) rose 3% YoY to 336 million during the quarter, leading to a spike of 10% in company’s shares. The total revenue of Twitter jumped 21% YoY, beating $607.6 million revenue estimated by Thomson Reuters. Revenue growth was primarily driven by the continued strong ad engagement growth, improved revenue features, improved ROI, and better sales execution. Interestingly, more than half of Twitter’s revenue ($347 million) came from the US. While the International revenue accounted for nearly 48% of Twitter’s total revenue, growing 53% YoY. Also when it comes to the userbase, Twitter added 6 million new monthly active users (MAUs) – 1 million from the home market US and 5 million from outside – in Q1 2018. The total number of Twitter users increased to 336 million by the end of Q1 2018 – 69 million US MAUs and 267 million International MAUs. Twitter’s growth is mainly international as the growth of users in US has been observed to be acutely stagnant. The company has pointed to strong growth in Asia. In Q4 2017, Twitter had reported its first-ever net profit with soaring $732 million revenue, up from estimated $686.1 million. Also, the number of monthly active users reached 330 million, below expectations of 332.5 million by the end of December 2017. Although the quarterly revenue has declined in Q1 2018 compared to previous quarter, the monthly active users have increased. Besides, the DAUs (daily active users) also increased 10% YoY during the last quarter. That’s surprisingly good from a business perspective. Twitter’s efforts, like live streaming on Periscope and offering more personalized content has finally paid off as it managed to grab the attention of both users and advertisers. Twitter’s prominence has grown significantly since last 2 quarters but it had to go through a long bumpy ride over the past few years. It took significant steps to deal with slow user growth and rampant issues of abuse and harassment which had adverse effects on the company and its growth. Twitter has made some major investments in broadcasting live events and shows from news to concerts using videos, and selling video ads in a bid to provide more engagement on the platform. In Q1 2018, more than 86% of Twitter’s revenue came from advertising, that’s an increase of 21% YoY. However, the videos contributed to more than half of ad revenue during the same quarter. While Twitter is not of the size of Facebook, this growth has catapulted the former to larger aspirations. Last year, it overtook Snap in market cap. Twitter has a unique position now in the social media realm as the users, who are proactive on the platform, and the advertisers have embraced it wholeheartedly. The recent developments highlight the fact that advertisers could be interested in a service beyond Facebook. Needless to mention that Facebook is facing deeper and severe issues related to data abuse and privacy. 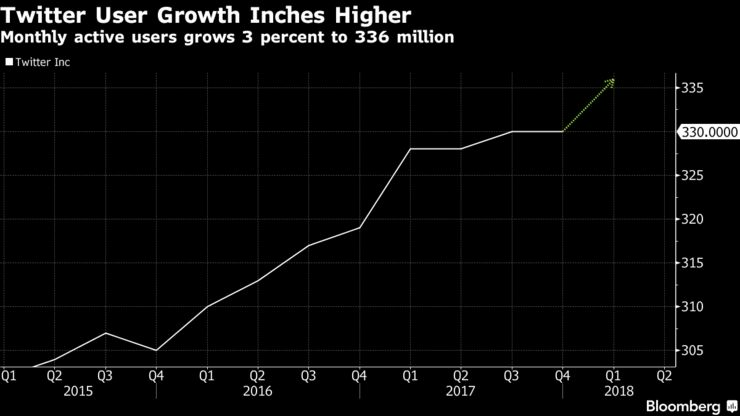 Facebook has 6 times more users than Twitter and increased its monthly active users by 13% YoY in the first quarter of 2018. The micro-social network, Twitter has been the voice of almost any and everything under the sun. Artists, politicians, celebrities, sportspersons and people from all walks of life have used to the platform to share their work, idea and thoughts with the world. Twitter is originally known for its short messages (140 characters), though, on November 7 last year, the company doubled the length of tweets to 280 characters, but also, the expansion is not available to some languages like Chinese, Korean and Japanese. The move didn’t really change the way how people use Twitter. Twitter is impeccable in the live feed of information and sought to specialize in “whats happening now”. The company swung to a net income of $61 million, or 8 cents a share, in the first quarter. A marginal loss from a year earlier when the net profit was $61.6 million, or 9 cents a share. The company earned 16 cents per share, compared to estimated 12 cents per share, excluding items, in this quarter.